This evening Alltech treated Symposium attendees to Kentucky Night which is far different than the formal International Dinner of last night. We’ve gone from opera to cowboy bbq and buffalo. 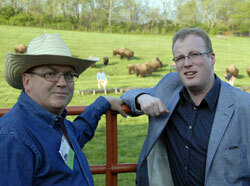 These are two Irish agricultural journalist friends posing in front of where the buffalo were roaming out at Alltech ranch. The international group had some beautiful weather for Kentucky Ale and steaks and a good band. Tomorrow it’s back to business with more seminars and and an afternoon session with a former U.S. Sec. of Ag. The Symposium photo album has almost 200 photos in it now.